A couple of months ago I decided that I’d have a go at producing a podcast. I have been enjoying sharing some experiences and memories of classic RPGs via twitter, so thought that it would be good to develop this further with a podcast. I’ve written a couple of episodes which each focus on a featured game. I was inspired by Jim Moon’s approach to podcasting. His Hypnogoria family of programmes are in-depth explorations of the weird and wonderful from his archive. Jim gives his personal reflections as well as providing detailed, engaging research on his chosen subjects. I particularly enjoy his obit. pieces, I recommend his Brian Clemons episode and his recent series on Sir Christopher Lee. I also like the magazine format of RPG Gamer Dad’s podcast. He is rediscovering his love of role-playing games through his young family. He has an infectious enthusiasm and great interview guests. I urge any games designer to get on the podcast, because immediately after an endorsement from RPG Gamer Dad, I can help myself, I have to buy it! 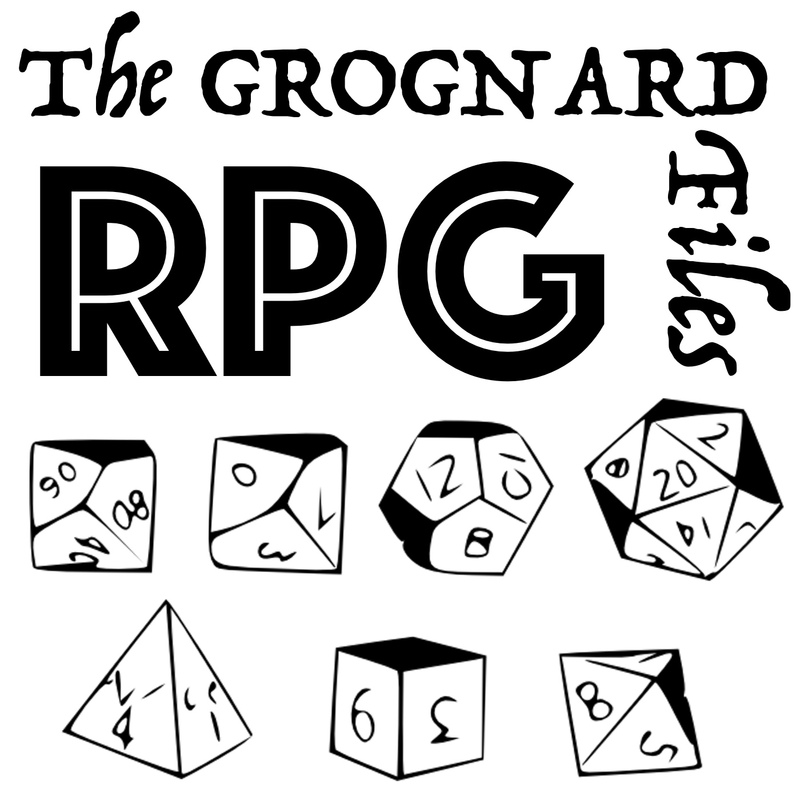 The GROGNARD files is the name of the Podcast that I’ve written, but now in the painstaking process of recording. I have developed a new-found appreciation for the effort of all podcasters. They make it look easy. The creation of the first episode is proving to be a painful birth for all involved. First – I can’t seem to find a quiet place to record it! My first attempt was blighted by the low hum of the dishwasher in the other room and the dog barking at me because she thought I’d gone mad. The next attempt was interrupted by Mrs Dirk bursting in asking what make of car seat we have, as a friend needed buying advice. This morning, I got up early to have a go, and child number 2 thought he would join me as he was feeling a bit unwell. Now the neighbours are using a chainsaw on their privets. Will everyone please SHUT UP! Second – I don’t have the best diction and often get tongue-tied. I was once edited out of a corporate video for being too boring. Playing back some of the early efforts, I can understand why. I’ve had to go back and re-record sections because I’ve not understood what I’ve said, never mind anyone else. Also, we have our distinct pronunciations of some of the fantasy words, that didn’t matter before, because only we heard them. How will people feel towards me saying Y-RUMS instead of WORMS for the bits on The Empire of the Wyrms Friends. Let’s face it, Y-RUMS doesn’t sound as daft, does it? Third – I don’t think I was prepared for how technical that it was going to be. I was expecting to do it all in Garageband and press a button. It turns out that there’s a bit more to it than that! There’s a section in the podcast where I will be recording a discussion over Google hang-outs, and I still haven’t really worked out how I’m going to achieve it. Any way, it’s coming, and I expect the first episode (about RUNEQUEST) to be available at the end of the month/ beginning of August. In the meantime, keep checking back here for updates, and ANY advice would be appreciated (on how to stop a chainsaw). So far you have been doing a brilliant job! Keep the podcast coming. As a German of about your age it is extremely interesting for me to get a British perspective of the olden days. I started gaming a bit later then your group did but there are parallels. Don’t worry about your diction, it’s fine (and I am not a native speaker)! Thank you very much! Thanks for commenting. I’m starting to feel a bit more confident about it now (although I do have a strange way of saying “rules”). Withe the latest Micro-Grog Pod it has reached the ‘tone’ I was trying to achieve – knowledgable but light-hearted. What editions reached Germany? Were many games translated? I’d be interested in knowing what games you played. One of the most satisfying aspects of releasing the podcast into the world is appreciating the shared experiences from different countries. The history of role playing games in Germany goes back quite a ways. The first German rpg was Midgard (1981), based on an older pro to-roleplaying game called Empires of Magira (1977).The game developed from a massive multi-player miniature war-game. There is a good book about German rpg history called Drachenvaeter (http://drachenvaeter.org/en/dragonfathers/). My history with rpg’s doesn’t quite go back that far. I started playing Das Schwarze Auge (http://rpggeek.com/rpg/1189/das-schwarze-auge-dsa-1st-edition) in 1986 but soon switched over to the German edition of Middle Earth Roleplaying MERS (http://rpggeek.com/rpgitem/51192/middle-earth-role-playing-1st-edition-revised). It must have been in 1988 that I first heard of Call of Cthulhu (Auf Cthulhus Spur) after having read a couple of H.P.Lovecraft’s short stories. I have been playing the game ever since although unfortunately very sporadic. The first Runequest edition that got translated into German was the RuneQuest Deluxe Edition (3.Ed) in 1991. This stayed the only ever translation of Runequest into German untilI recently.I just read that there is a translation of Runequest 6 available now. Back in the day I remember playing a game or two of RQ but getting distracted by Shadowrun 1.Ed at the time. I believe Germany is still the second biggest market for roleplaying games worldwide. The hobby picked up early and from the beginning there were a steady flow of translations of foreign rpg’s. It used to be (and still is) fairly easy to get new games in their original language. Additionally there are quite a lot of original German rpg’s out there, some even made the jump to other languages. I have never stopped playing but don’t get around to it very often. In the meantime I collect a variety of rpg’s and enjoy reading up on the history of our hobby. I can recommend the Designers & Dragons series of books (http://rpggeek.com/rpgseries/25621/designers-dragons). Having lived in a couple of different countries & continents I have always found role playing gamers to be very accepting and easy to spend time gaming with. I hope to keep gaming into old age. Thanks for providing a unique insight into your & your friends history of gaming! Keep the podcast coming! PS:Please excuse my rambling style and any typographical or grammatical errors in this post. Thank you for a very thorough response and some great references (I wasn’t aware of the Designers and Dragons books, I dutifully downloaded them yesterday). Please can I use elements of your post in the next postbag? I think it provides a different perspective on the hobby than the usual Anglo-American narrative. I am glad I could provide something of interest. Feel free to use any part of my posts in the postbag section of the podcast. A history of wargames and role-playing games. It covers RPGs as the “signature cultural innovation of the late twentieth century” . In the interest of disclosure: I have not been living in Germany for more then 10 month since 1998 and therefore have only glancing knowledge of the current rpg scene in my country of birth & youth. For at least another eight month I call Atlanta, GA (home of DragonCon http://www.dragoncon.org/) my home.